Marriage*: She married Michael Nehs. Marriage*: She married _____ Lyons. Marriage*: He married Katherine Brown, daughter of Ernest Brown and Nannie A. Cochran. 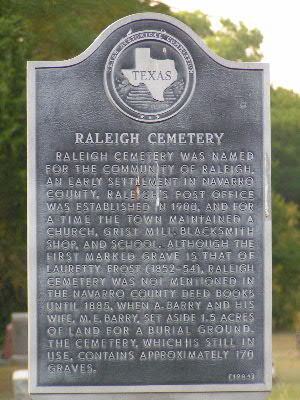 Texas state historical marker, Raleigh Cemetery, Raleigh, Tex., courtesy of Dana Stubbs. Click on image to enlarge it. [S1115] Edward Lynn Williams, electronic mail to Roger Bartlett, 9 Nov 1998 (naming William W. Frost as this child's father). [S1115] Edward Lynn Williams, electronic mail to Roger Bartlett, 9 Nov 1998 (naming Mary Louisa Brewer as this child's mother). [S1115] Edward Lynn Williams, electronic mail to Roger Bartlett, 9 Nov 1998 (stating that this child probably died in Navarro County, Texas). [S755] Anna Baker & Anne Cochran, Cochran Chapel Cemetery (1976), above (naming Laura Jacoby as his mother). [S755] Anna Baker & Anne Cochran, Cochran Chapel Cemetery (1976), above (naming H. H. Jacoby as his father). [S955] Jim Breckenridge, electronic mail to Roger Bartlett, 15 Mar 2004, (naming George Castleman Breckinridge as his father). [S955] Jim Breckenridge, electronic mail to Roger Bartlett, 15 Mar 2004, (naming Lydia Pearl Coles as his mother). [S1118] U.S. Department of Veterans Affairs, gravesite locator, online http://gravelocator.cem.va.gov, viewed on 30 Dec 2006. [S955] Jim Breckenridge, electronic mail to Roger Bartlett, 15 Mar 2004, (stating that he was a cowboy). [S1118] U.S. Department of Veterans Affairs, gravesite locator, online, above, viewed on 30 Dec 2006 (stating that he had been a private in the U.S. Army). Other Names*: Virginia Breckinridge, Virginia Castleman Smith, Virginia Breckinridge Smith, Virginia Smith. • Photos of the beautiful grounds of Sleepy Hollow Cemetery are here. [S955] Jim Breckenridge, electronic mail to Roger Bartlett, 15 Mar 2004, (naming George Castleman Breckinridge as her father). [S955] Jim Breckenridge, electronic mail to Roger Bartlett, 15 Mar 2004, (naming Lydia Pearl Coles as her mother). [S1235] Anita Marie Smith Clifford, electronic mail to Roger Bartlett, 14 Feb 2012. [S1235] Anita Marie Smith Clifford, electronic mail to Roger Bartlett, 14 Feb 2012, (also stating that John's twin brother, the Rev. Richard Upsher Smith, an Episcopal priest, officiated at the wedding). [S1235] Anita Marie Smith Clifford, electronic mail to Roger Bartlett, 14 Feb 2012, (also stating that John's twin brother, the Rev. Richard Upsher Smith, an Episcopal priest, officiated at the funeral). [S755] Anna Baker & Anne Cochran, Cochran Chapel Cemetery (1976) (naming Laura Jacoby as his mother). Tom Ellis provided an electronic copy to Roger Bartlett on 5 Jul 2002. [S67] The Dallas Morning News, Dallas, Tex., 12 Jul 1974, sec. D, p. 3 (obituary of Henry H. Jacoby) (not giving the date but stating that he was seventy-six years old when he died on 10 Jul 1974). [S67] The Dallas Morning News, Dallas, Tex., 28 Jul 1933, sec. 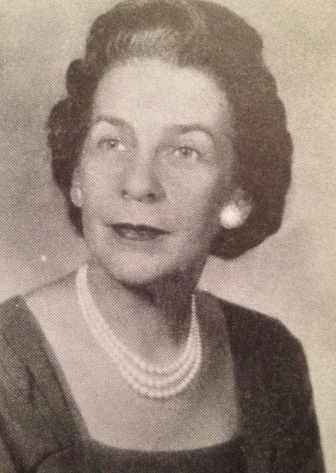 I, p. 6 ("Miss Margaret Cameron Miller Bride of H. H. Jacoby Jr. at Thursday Rites"). [S1108] Social Security Death Index, online at http://tinyurl.com/RootswebSSDI, viewed on 3 Feb 2007 (stating that he died in Jul 1974; not naming the place of death but stating that he lived in Dallas, Tex. when he died). [S67] The Dallas Morning News, Dallas, Tex., 12 Jul 1974, sec. D, p. 3 (obituary of Henry H. Jacoby). [S67] The Dallas Morning News, Dallas, Tex., 12 Jul 1974, sec. D, p. 3 (funeral notice for Henry H. Jacoby). [S755] Anna Baker & Anne Cochran, Cochran Chapel Cemetery (1976), above (stating that he was born on 12 Dec 1897). [S67] The Dallas Morning News, Dallas, Tex., 12 Jul 1974, sec. D, p. 3 (obituary of Henry H. Jacoby) (identifying survivors). [S67] The Dallas Morning News, Dallas, Tex., 12 Jul 1974, sec. D, p. 3 (funeral notice for Henry H. Jacoby) (identifying survivors). [S67] The Dallas Morning News, Dallas, Tex., 17 Jul 1992, p. 33A (obituary of Margaret Miller Jacoby) (not giving the date but stating that she was eighty-nine years old when she died on 14 Jul 1992). [S67] The Dallas Morning News, Dallas, Tex., 17 Jul 1992, p. 33A (obituary of Margaret Miller Jacoby). [S1108] Social Security Death Index, online at http://tinyurl.com/RootswebSSDI, viewed on 31 Dec 2006. [S1108] Social Security Death Index, online at http://tinyurl.com/RootswebSSDI, viewed on 31 Dec 2006 (giving the date but not the place). [S67] The Dallas Morning News, Dallas, Tex., 10 Jan 2003 (death notice for Anne Adelia Cochran). [S67] The Dallas Morning News, Dallas, Tex., 15 Jan 2003, p. 21A (obituary of Anne Adelia Cochran) (giving the date but not the place). [S67] The Dallas Morning News, Dallas, Tex., 15 Jan 2003, p. 21A (obituary of Anne Adelia Cochran). Other Names*: Laura Latimer Bolton, Laura Bolton. [S1120] Independence United Methodist Church Cemetery, Tignall, Ga., online http://www.giddeon.com/wilkes/cemeteries/indepumc.shtml, viewed on 31 Dec 2006. [S961] Find A Grave, online at http://www.findagrave.com, memorial for Laura Latimer Bolton, memorial no. 33522073, viewed on 13 Apr 2015. [S961] Find A Grave, online, above, memorial for George Fortson Bolton, memorial no. 33522030, viewed on 13 Apr 2015. [S1108] Social Security Death Index, online at http://tinyurl.com/RootswebSSDI, viewed on 3 Feb 2007 (not naming the place of death but stating that she lived in Tignall, Ga. when she died). [S1123] Beaverdam Baptist Church Cemetery, Wilkes Co., Ga., online at http://www.giddeon.com/wilkes/cemeteries/beaverdam.shtml, viewed on 31 Dec 2006. [S1108] Social Security Death Index, online at http://tinyurl.com/RootswebSSDI, viewed on 31 Dec 2006 (stating that he died in Mar 1970; not naming the place of death but stating that he lived in Washington, Georgia when he died). [S1125] Fishing Creek Baptist Church Cemetery, Wilkes Co., Ga., online http://www.giddeon.com/wilkes/cemeteries/fishingcreek.shtml, viewed on 31 Dec 2006 (naming Emma I. Bobo as his mother). [S1125] Fishing Creek Baptist Church Cemetery, Wilkes Co., Ga., online, above, viewed on 31 Dec 2006 (naming S. S. Bobo as his father). [S488] Matthews Family Information, online http://www.rootsweb.com/~txhender/Cemeteries/AthensCityCem/…, viewed on 6 Jan 2007, (naming Emma Grogaard as his mother). [S488] Matthews Family Information, online, above, (naming Thomas M. Matthews, Sr. as his father). [S488] Matthews Family Information, online, above. [S488] Matthews Family Information, online http://www.rootsweb.com/~txhender/Cemeteries/AthensCityCem/…, viewed on 6 Jan 2007, (naming Thomas M. Matthews, Sr. as his father). [S488] Matthews Family Information, online, above, (naming Emma Grogaard as his mother).